Our level 4 trainers have particular skills in helping people with almost any disorder regain fitness, stamina and strength. Often prolonged recumbence or resting leads to sluggish body and mind. This really can be reversed with the correct careful programme designed to pick you up. The sessions will be enjoyable, very supportive and something to look forward to at a time often of great challenge. Mark decided early that fitness and personal training was for him and rapidly passed his level 2, level 3 and level 4 personal training qualifications. He has also completed the GP referral course. This will make him one of the few personal trainers who have extended their knowledge to that level. He has a special interest in back pain and weight loss. A more than useful footballer, he is a natural at all sports and has an enthusiasm about his training that is as effective as it is inventive and enjoyable. Mark works on the principle that all aspects of life are fun and that should include what you do with regard to your physical health and training programmes. 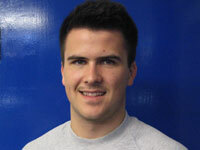 He has been a full time Personal Trainer within the David Lloyd organisation. He has developed a specialist interest in the Personal training of people with back pain Many PT’s fight shy of this problem as it can be so challenging to help. Mark has the opposite approach recognising that such sufferers need extra skilled assistance and Mark will work with you to make sure you are in control of your back not your back in control of your life His working motto is “Get Back in control”.